Number 109 is the second of the new era of the veteran magazine TELOS. This publication has modernized its design, it has been deployed in the digital environment with a live and participative web page and has opened its content to new topics aimed at a broader spectrum of readers. 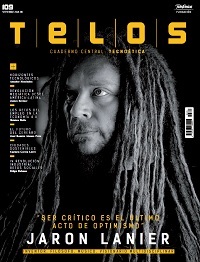 The cover image of TELOS 109 is Jaron Lanier, recognized among the three hundred most important inventors in history by the Encyclopedia Britannica. In the interview he exposes his vision about the capacity of virtual reality to illuminate and expand our understanding of the moment and urges us to review the digital universe that we are building. The dossier of this number is dedicated to the ethical issues posed by progress; to the motivations and objectives by which the human constantly seeks the improvement of himself and his environment. From different perspectives, the authors -Antonio Garrigues, Elena Postigo, Fernando Broncano, Lluc Torcal and Andy Stalman- advocate development that puts the values ​​of humanity above everything else.